Ahead of the curve as always, AVS proudly debuts its Aeroskin LightShield(TM) Hood Protector, the only hood protector that offers amber LED marker lights for the edge of your hood! 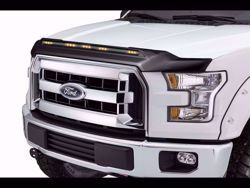 The light bar consists of 5 LED marker lights and is powered by connecting into the vehicle's parking lights for a seamless integration. This is the hood protector to choose for peace-of-mind protection and a dramatic distinctive look.